Good Evening Blog Friends…. I’ve been so busy today! I am going to be Maid of Horror in my best friend’s wedding on Saturday so I have been busy primping (which is SO NOT me!) LOL!!! I actually managed to dye my hair and no lives were lost in the process!! Now with the grey hair out of the way all I have to do is EVERYTHING else!! *sigh* toes, nails, brows… OMG! Men have it so easy! LOL!! Okay enough of my whining! I have SOOO missed playing along with challenges this summer. 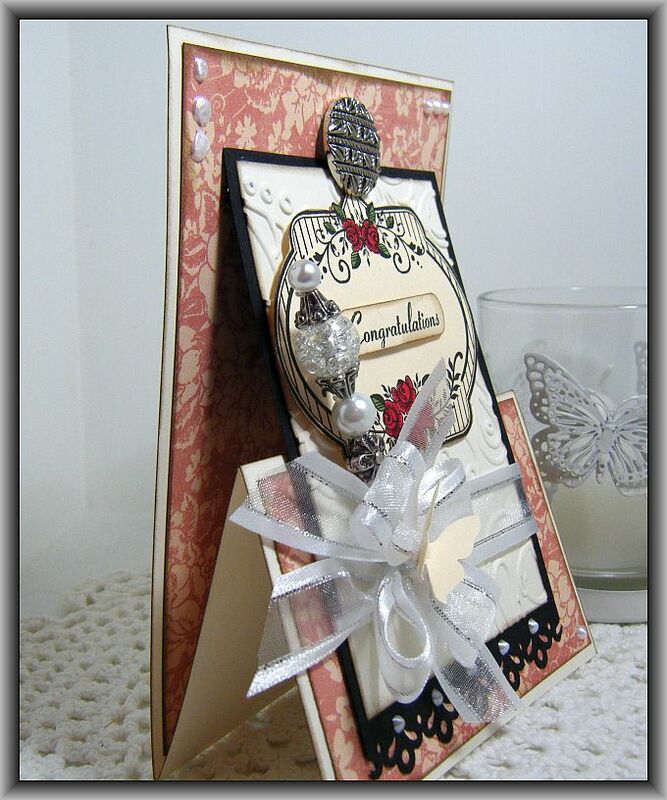 Over at JustRite they are asking us to do a fancy fold and ohhhh how I love me a fancy fold! Here’s what I came up with…. 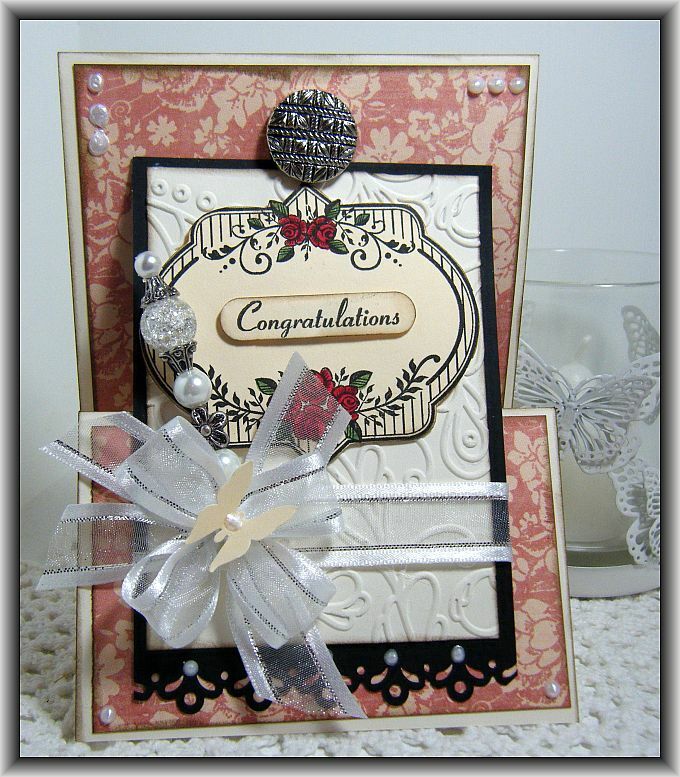 For this card I used the JustRite Vintage Rose Medallions stamp set. Beautiful huh? I picked this stamp set up at The Cutting Garden (of course) LOL!!! I hope everyone is having a fantastic evening and thanks so much for stopping by! Categories All Occasion, Cards, Congrats! Good Afternoon Blog Friends and Happy Monday! I am enjoying spending an extra day onto my weekend, home puttering around the house. I’ve been doing a few chores and have decided to make yummy ribs for Tony for supper tonight in my crock pot and they are simmering away and smelling delicious! 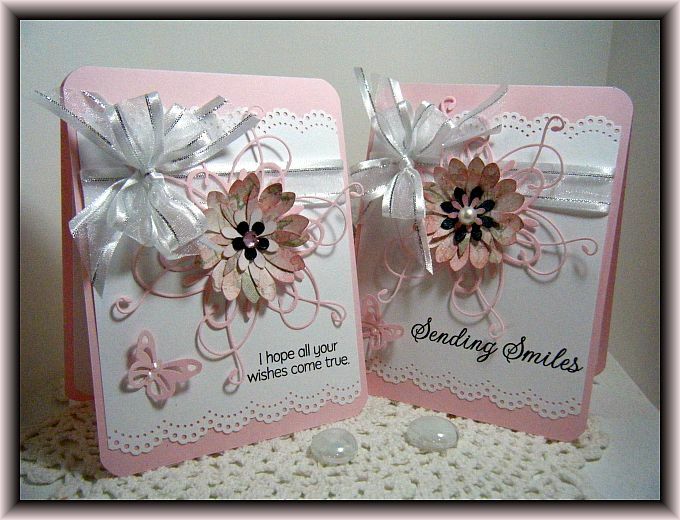 I have a couple of pretty pink cards to share with you today…. These were super easy to put together and I have to say, I’m pleased with the flowers I made using my daisy punches. Now they are not Lauren flowers… lets face it… that woman is a flower making dynamo! You can find her fantastic tutorial HERE. 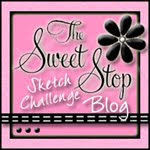 Check it out, you will be glad you did!!! Don’t forget to drop her a comment and tell her I sent you! I hope you all have a wonderful day and thanks so much for stopping by! !